Our brain needs oxygen and blood so it could maintain its proper function. If there is a blockage of the blood vessel leading to the brain, it will start to bleed and may result in hemorrhagic and ischemic stroke, very dangerous conditions which in many cases are fatal. 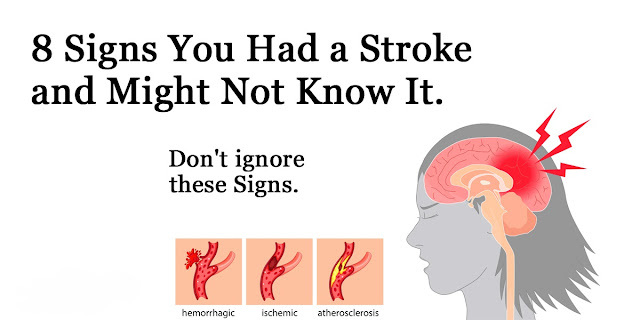 Just like in the case of the other health problems, many people ignore the symptoms of stroke. Stroke is a death-threatening condition which currently takes the 5th place on the list of most common deaths in America. So, in order to protect yourself, it is very important to learn how to recognize the early symptoms of stroke. If you are having a headache or a bad migraine for a longer period of time, you should consult your doctor immediately! Even though it is an overlooked symptom, extreme fatigue lasting for a long period can be a symptom of stroke. According to the American Stroke Association, you should follow the FAST acronym in order to recognize the symptoms of stroke. S —speech difficulty. When a stroke occurs, the lack of blood supply to the brain may lead to slurred or garbled speech. T —time is crucial in cases of stroke. Call an ambulance immediately because in most cases this step is considered as the thin line between life and death! When a stroke occurs, the lack of oxygen and blood supply to the brain leads to an inability to think and speak properly and confusion.